Over the past week I've been able to glue up the Walnut rings that will eventually make up the frames for the top of the Pi boxes. 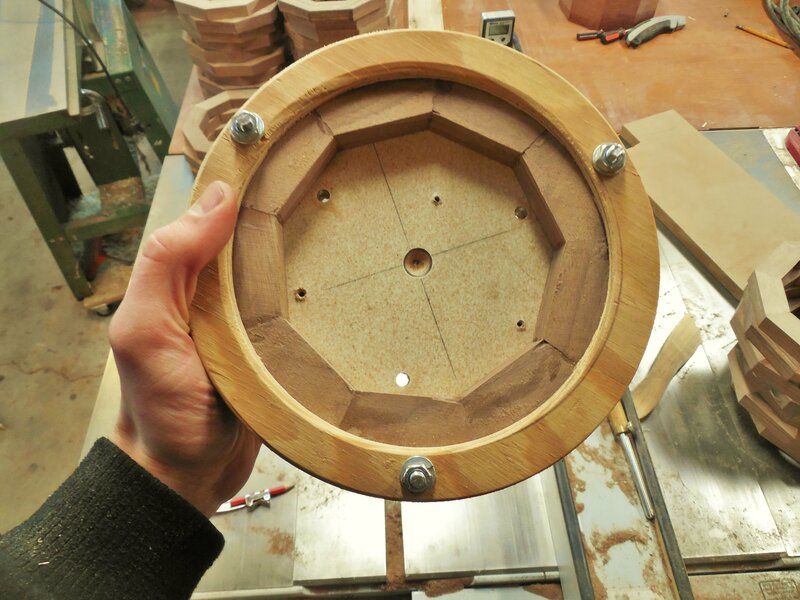 I was going to turn the center of the lids circular on the lathe as I had done with the prototype, but I actually found the process easier and quicker using a router. 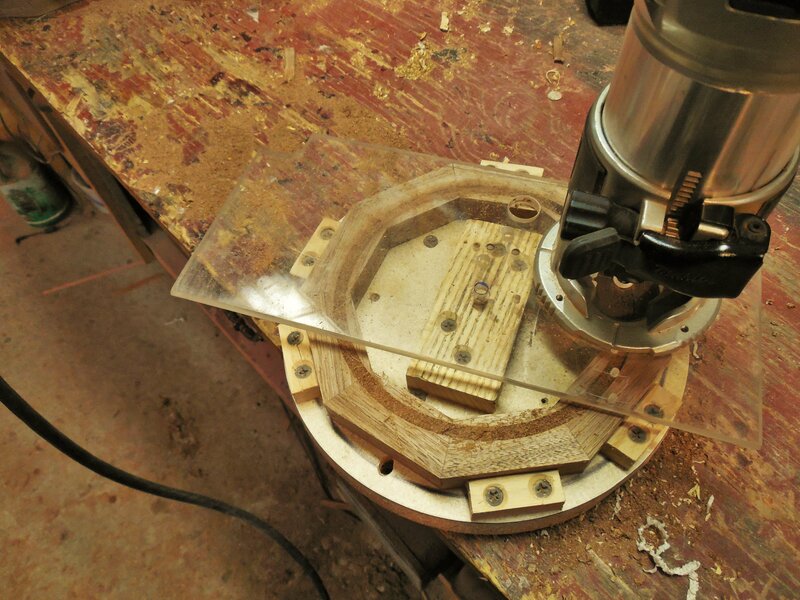 I made the jig in the picture below for holding the rings on a faceplate as I turned out the center on a lathe. 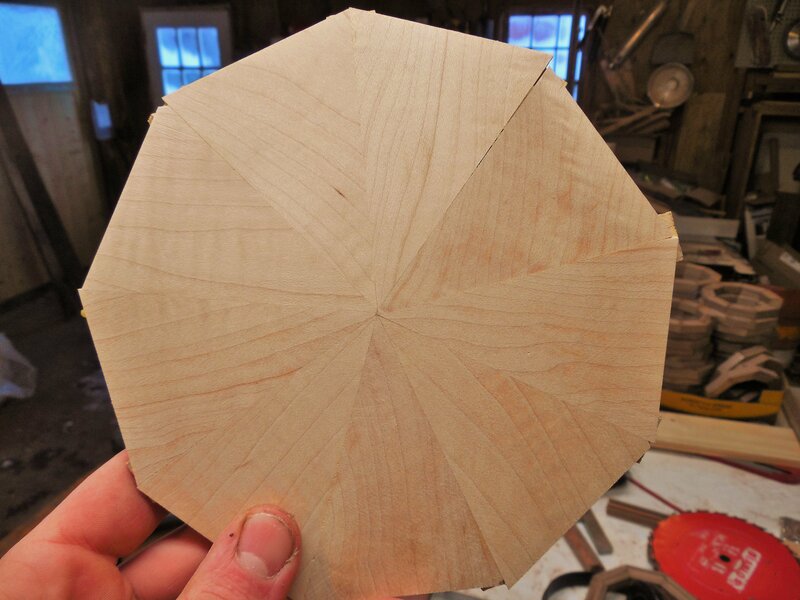 I was able to instead simply put a dowel at the center of this jig and rotate my router around the dowel to cut out the center. 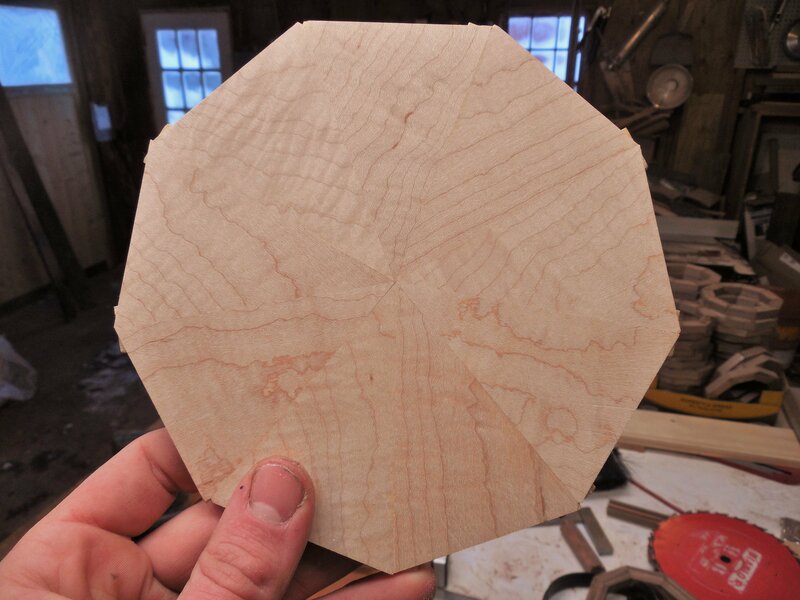 This method was far quicker and more precise than turning on a lathe would have been so I'm quite happy I arrived at this solution, however, I did break three router bits over the span of 150 router passes so there was a cost involved but I'm still pleased with the results. I had issues with about half of the Curly Maple box bottoms during the glue up stage. Though its hard to see in the pictures above there are hairline gaps or seams in some of the bottoms as a result of poor alignment when clamped for the final glue up. I didn't detect this error until it was too late, unfortunately. I experimented with sawdust and glue fill in the seams but the joint then becomes highlighted and I don't approve of this so I've decided to remake many of the box bottoms. This will set me back a couple days which is unfortunate but is part of the business. I'm happy to make mistakes so long as I can figure out the cause of the problem, which in this case was pretty obvious. Pretty soon I'll be gluing up my blocks of green/purple Yosegi that will decorate the tops of the boxes. I'm also getting very close to being able to glue up the puzzle box sides, which will be very inspiring to see.